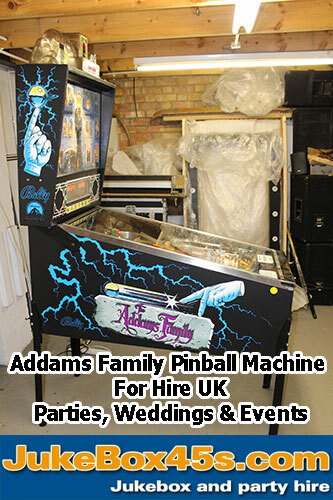 Click Here to see our other great Pinball Machines we have to hire. Notable Features: Flippers (4; 3 regular-sized, 1 "Thing Flips" game-controlled mini-flipper), Pop bumpers (5), Ramps (2), Kick-out hole (1), Dual left inlanes. First ever optical target bank (in the bookcase). Bookcase, when active, rotates to reveal a lock hole. Magnets under the lower playfield activate as "The Power", an earned feature during play to affect ball movement. 2- or 3-ball multiball. Upper right playfield has "Thing", a large plastic hand that comes out if its box to magnetically pick up the ball and take it below the playfield. Toys: 'Thing' hand - ball capture device. Notes: 'The Addams Family' has a flipper that not only is controlled by the player's flipper button but also is caused by the game programming to flip at certain points in game play. One earlier form of "auto-flipping" appears on Williams' 1953 'Palisades'. This game broke all previous sales records for flipper games. Designer Pat Lawlor wanted to commemorate the actual record-breaking game from the production line and arranged to have it made in a gold cabinet. This change caused a number of games made subsequent in this original run to also have gold cabinets. At least their lower cabinets were gold, even if their backboxes were still made in blue. Included in this listing are pictures of one such example of this "Later Production" version having the mixed gold and blue. The legs, metal trim, and lockdown bar are not gold. Then, in 1994, The Addams Family was put back in production with a special run of 'Gold Edition' machines to further commemorate this machine becoming the best selling flippergame of all time. These machines had many more Gold accents, such as the metal ramps, gold legs and bolts, gold lettering, the vault plastic, the bumper caps and Thing's box. Each "Gold" machine includes a certificate signed by the members of the design team and a gold plate on the lower right front of the machine containing the machine number. The way our line worked, the cabinets and backboxes were created separately then joined later and this created a logistical problem for keeping gold with gold and blue with blue along with the likelihood that we had more spoilage in backboxes than cabinets (or the other way around) meant that a small number of games were mis-matched. The record breaking game was #20,232. That game is the one we all had our picture taken in front of, and then on the cover of Replay. The inside of the game was signed by every worker on the line that day, and is in the possession of Gene Cunningham. Larry, you are correct that the final few games were made with the Gold. That's because you do not just make 1 cabinet when you are doing screen print production, you make many. Once the change was made, they just kept making them. Yes, there are mis-matched cabinets out there, probably orphans on the "hospital" line at the factory. That's the area where games with problems were kept until the techs could get around to fixing them for shipment. Another possibility is that Odd parts were sometimes assembled to get the last few games of any run out the door. The art for the plastics had to be approved and sent for production 3 weeks before prototype games were built. During early play testing we noticed that people could not figure out how to open the vault. So we changed the art for later plastics, but in order to use the ones already in house we put the sticker on them. It happened all the time with changes from testing to production. It was a normal part of the business. 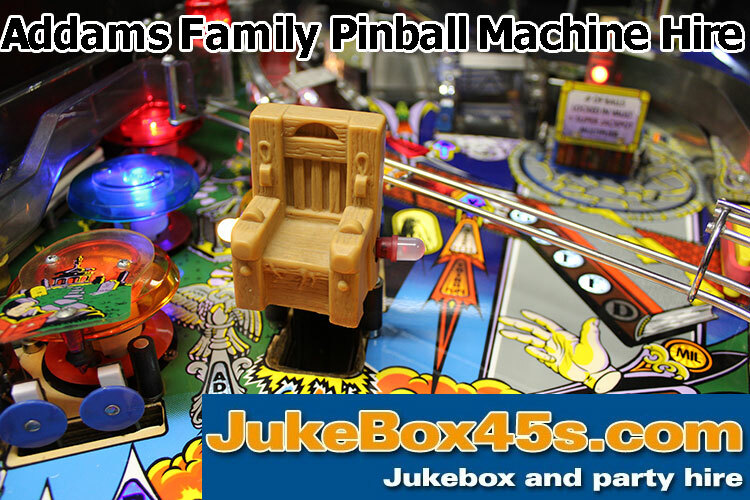 Marketing Slogans: "A pinball experience for the whole family!" "Now there's some `thing' special in pinball!" 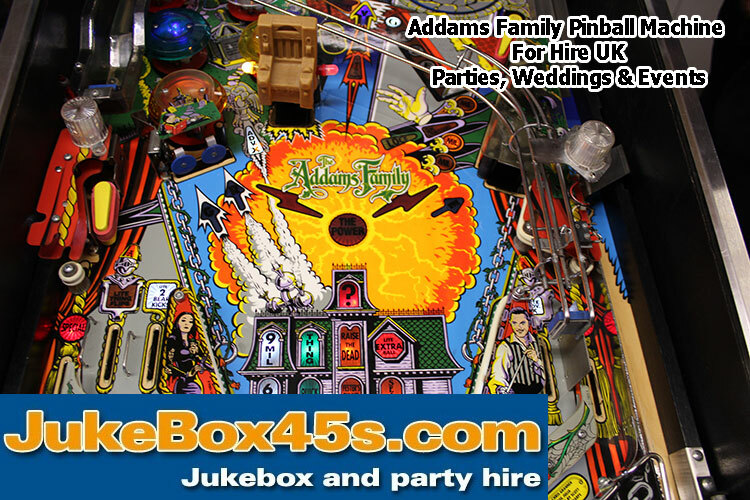 This is an excellent example of an Addams Family Pinball Machine and perfect for an event, wedding or party hire.